Although this blog exists because of my writing, I’ve been known to post stories and photos about The Daughter, volleyball, and my crafts….among other things. 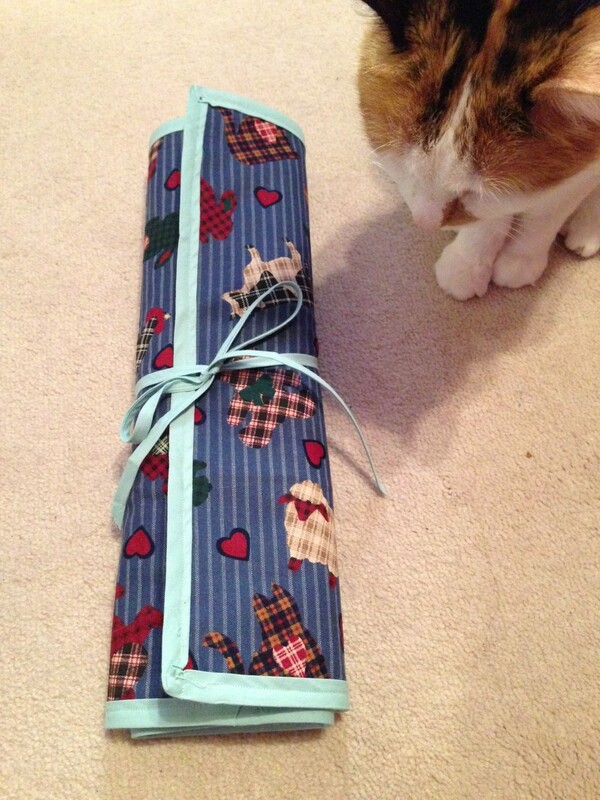 Today’s blog is something new and different for me, I’m posting a pattern for a circular knitting needle case. Why? 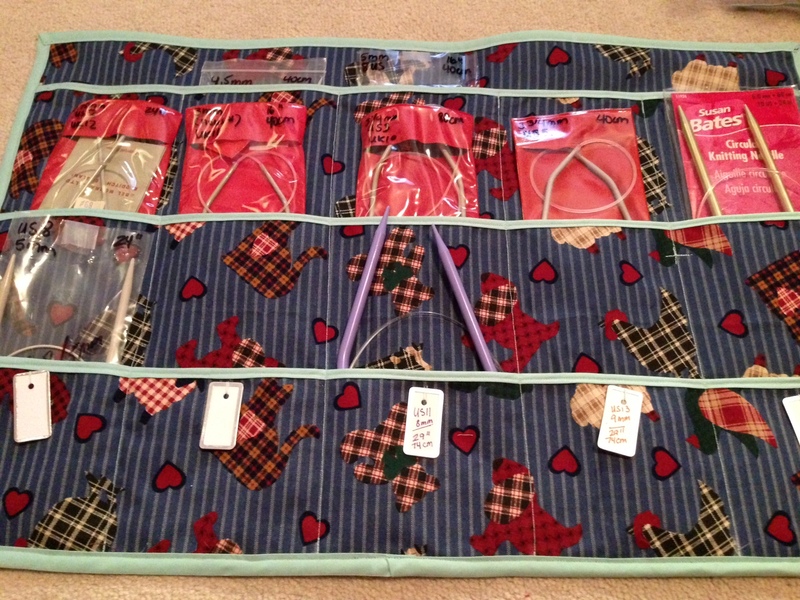 Well, I’ve been wanting a case to organize my circular needles, and one of my craft magazines recently showed one on sale. When I went to the website, the case was sold out, and thus began the search. After witnessing the price of these cases at other on-line stores, I then began looking for free patterns. (Because, I don’t already have enough crafts on the go.) For once, a search of the internet came up lacking. I went to the craft closet and found some material hiding in one of the many boxes. As I began to plan out the case, I decide I would write it all down and take photos, so that the next person searching for “Free Pattern for Case for Circular Knitting Needles” would actually find something they could use. So if you are interested, the pattern and photos are below. After seeing how easy this was, I’ve also decided to alter the pattern and make cases for my crochet and other needles, and I’ll post photos and pattern changes for them in the near future. I started with a piece of material 45” wide by 55” long. (Weird size? Maybe, but remember everything I used is from the craft closet. As such, I started with a piece of old material that I originally bought for quilting.) I trimmed those ugly white edges off and cut the piece in half lengthwise, so my working piece is 21.5” wide by 55” long. 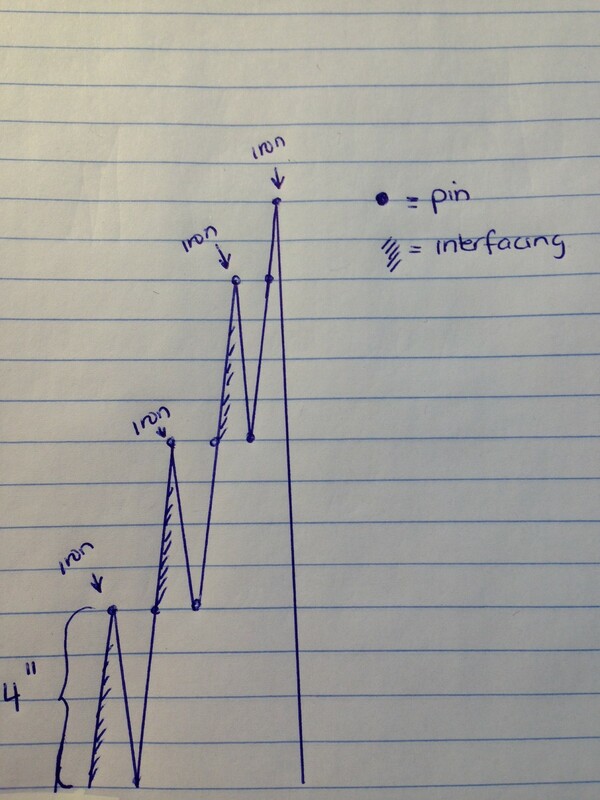 Using pins or chalk, mark 4” from the bottom. Mark at 4” intervals, eight more times, ending at 36 inches. Now put a final mark at 38”. With wrong sides together, iron at the 4” markings. With wrong sides together, iron at the 16” markings. With wrong sides together, iron at the 24” markings. With wrong sides together, iron at the 38” markings. Sew double fold bias tape along the 4”, 16” and 28” inch ironed folds. On the inside/pocket side, mark off the size of your pockets, two inches from top to the bottom of the case. I decided to have five pockets roughly 4 inches each. 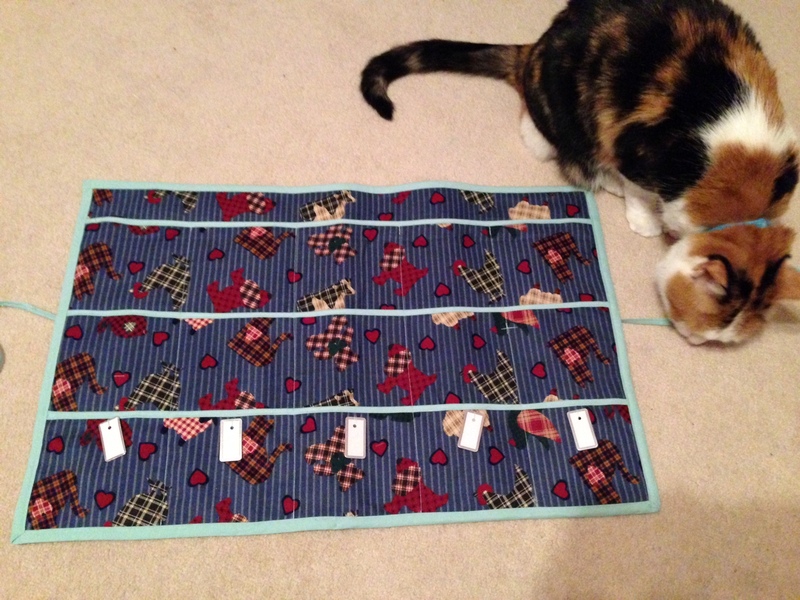 Note 2: I first thought of having 4 pockets on the bottom row for bigger needles, and five on the top and middle rows for smaller needles BUT…all pockets must be of the same size, or your case will not roll up. Sew along the chalk lines – again, from the top of the first pocket, to the bottom of your case. 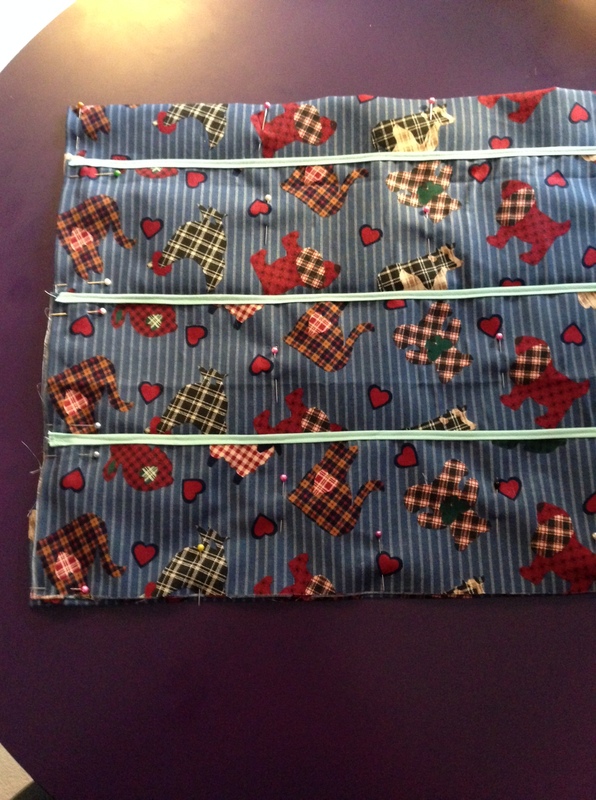 Sew remaining double wide bias tape (the thinner one, used on the fold) closed…you will use this as a tie. With outside facing up, attach tie to case on outside of case, 6” from the bottom and 4”from the left edge. This entry was posted in Charlotte Copper, Circular Knitting Needles, Free Pattern for Case for Circular Knitting Needles, Free Pattern for Circular Knitting Needles Case, Knitting, Other Passions, Pattern for Case for Circular Knitting Needles by Charlotte Copper. Bookmark the permalink.